Forever trying out new foundation, even thought I already have few favourites, I still want to try out more! I think I am a foundationholic, does something like that even exists? Anyways I like medium to full coverage foundation, unless I have good skin day I will use lighter coverage foundation or bb cream. 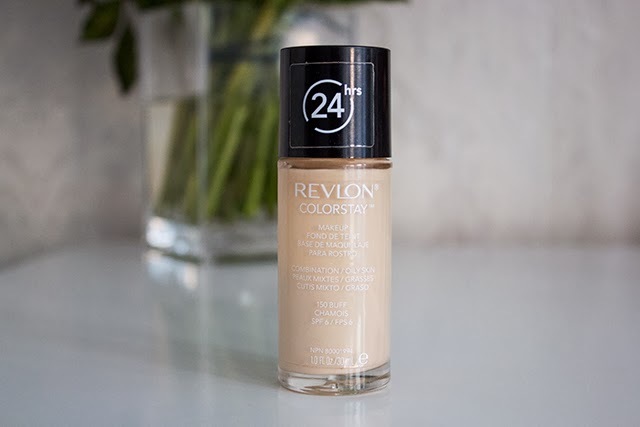 I always liked Revlon foundation Photoready is still the one which I like. I admire Estee Lauder Double Wear during winter time and when I heard that ColorStay is similar I just had to try it out. The coverage is really similar, but I feel like Double Wear lasts a bit longer on the face, whereas ColorStay lasts for around 6hours and then it slowly starts to disappear from the face. Its medium to full coverage, the scent is also very pleasant not paint like, but more floral? I really love the colour match as it works with my pale complexion really well. Sometimes when I want lighter and more glowing coverage I mix it with Rimmel Wake Me Up foundation. I would also recommend mixing the foundation with cream when you want lighter coverage. One annoying thing about the foundation is that it doesn't have a pump, well it's not the end of the world, but I just like when a foundation has a pump. Normally I tend to reach for high end foundation more often, but to be honest there are lots of great lower end foundations. Revlon ColorStay is definitely worth a try, there are two formulas, one for Oily/Combination skin and for Dry/Normal. I think that the lightest shade is perfect for pale girls. Have any of you had a chance to try out Revlon ColorStay, what do you think? This sounds like it's definitely worth a try, will opt for the Oily skin combo. Thanks for sharing! I actually really like this foundation! I bought the normal/dry version because I ran out of the oily/combination. I'll have to try the photoready one!